Super Training is a combination of mini-games. Only one of which is currently known. 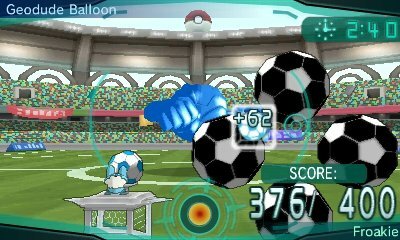 In this game, you have a Pokémon in the field and you need to control it, using the touchscreen or the Circle Pad, in order to deflect Balloon Bots balls from going into your goal, while you send various balls into your opponent's goal. Green: These balls are incredibly powerful but are slow to fire. There are three different levels to the games, unlocked as you go through Level 1, 2 and 3. When you complete the games, you get an increase of Effort Values in that one specific stat. Level 1 gives you +4, Level 2 gives you +8 and Level 3 gives you +12. 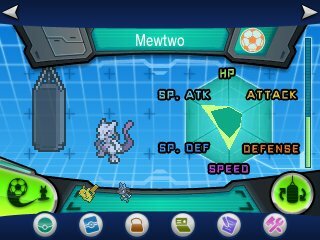 Each individual Pokémon's progress is tracked, with them receiving medals for each game completed. 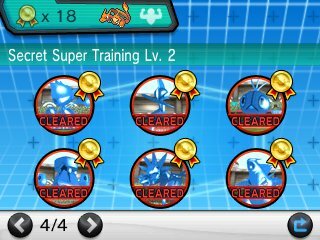 If you are using a Pokémon who has got maximum Effort Values, you will gain access to Secret Super Training. This mode gives you 12 more mini-games to play, with increasing difficulty. However, these games give you more than just bags for core training, they also have a chance of giving you rare items. These items range from items such as Clever Wing, to evolution stones These items are rare and depend upon how well you complete. You can also get various healing items, items such as Stardust and hold items such as Hard Stone.